Hello, I’m Wendy! I have trained as a speech & language therapist and a musician. From 1986 to 2012 I worked as a music specialist at Sutherland House School for children with autism, helping the children’s social and communication development through an approach known as Musical Interaction. I have run courses, workshops and in-service days around the UK on using music with young children, with a focus on developing communication. This included many training days for ICAN, a national educational charity (www.ican.org.uk), and workshops to help Sure Start workers run music groups for very young children and their parents. I set up the Early Years Music Groups in 1996, to bring some of the ideas and skills I had developed in my other work into my local community. I also run the Speech, Sign and Song Club (www.speechsignsong.co.uk) on Wednesday afternoons in Beeston, with my colleague Roma Seth. This is a music group for children who have communication difficulties and may find it hard to take part in other community activities. After leaving Sutherland House School in 2012, I set up Wendy’s Playful Piano for 3-7 year olds at my home in Beeston. (www.wendysplayfulpiano.co.uk) In individual lessons, I aim to share the joy of music and teach vital early skills at and around the piano. I have a long waiting list for these sessions, so please think ahead if you are interested! Why can’t I find the online application form? You can only apply once you have registered as a user and are logged in on this site. This is to prevent spam users. Please click on Login/Register at the top right of any page on this site. Once you have your password, you can login and go to the booking page to open the form. If you still can’t find the form, then it’s just that the old one is out of date and the new one is not yet available. You should automatically receive an email with your account details when you register with the site but if for any reason you cannot access this you can Click here to reset your password, or click on ‘Forgotten Password’. Why can’t I get my form or message to send? If you get the ‘Failed to send’ message, it’s because there is a temporary problem with the site. Be assured that I am on to it and doing everything I can to get it working again! Please email me on wendy@eymg.co.uk if you can’t contact me through the website. Can I bring my older child, who is ill today/has an inset day? Which age group should I book? If your child is turning 2, you should generally apply for an older group. Between 18 months and 2 years, they could be in either group. The older groups always have a few younger children in too; mainly siblings of the older ones. Some children with less confidence or additional needs may benefit from staying in either group for a bit longer – that’s fine, just talk to me! Why do music with young children? Mainly because they love it. so they attend to it and take an active part. As well as enriching their everyday lives, musical activities can help to prepare children for nursery and school, by building their social confidence and laying the foundations for literacy and numeracy. Physical skills: coordination of whole body and fine finger movements. 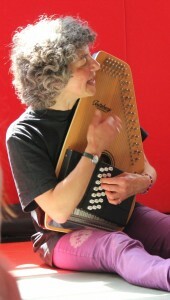 I play an autoharp: I often shorten it to ‘harp’ when talking to the children. It’s a type of zither with automatic chord buttons, which are labelled. It’s really easy to play, though I have had to stop jumping, dancing, running and hopping whilst playing it, owing to a shoulder problem… I now use the ukulele for moving around, as it’s much lighter than the autoharp! In the USA there are huge international autoharp contests and festivals. UK Autoharps (www.ukautoharps.org.uk) provides information and courses in this country for everyone from beginners to advanced players. Where can I take my child for music when he or she is 3? There are several other musical activities available for children over three. Sue Lake runs Music Makers locally for 4 – 6 years, and Roma Seth does Rockabillies in Long Eaton for 0-5 years. These and many other groups can be found in publications and websites such as ‘Family Grapevine’, ‘Lots for Tots’ and ‘Netmums’. Why don’t you put on more groups? This isn’t my only work! As well as Early Years Music Groups, I am involved in the Speech, Sign and Song Club on Wednesdays (www.speechsignsong.co.uk) and run Wendy’s Playful Piano (www.wendysplayfulpiano.co.uk). Where can I get CDs of the music you play between sessions? How can I keep up to date with information about the Early Years Music Groups? If you subscribe to the Blog on this website, you will get an email whenever I put up a new post. Please go to your profile to manage your subscription to the blog, then click on ‘update’. Are my personal details secure on the eymg website? If you no longer want to receive updates from us please enter your email address and submit. We will remove you from our database.